Codrington Farmers' MarketRecord Owner? Log in. Sunday:	10:00 am - 2:00 pm May 15 through October! Established by a core group of fresh food enthusiasts, the Codrington Farmers' Market will answer the plea for fresh, local, wholesome produce and baked goods. Locally grown produce, fresh flowers, honey, beef, chicken, pork, lamb, goat, rabbit, wine, hard cider, baked goods, handmade soap, annual and perennial plants, vegetable seedlings, garlic, artisan crafts. 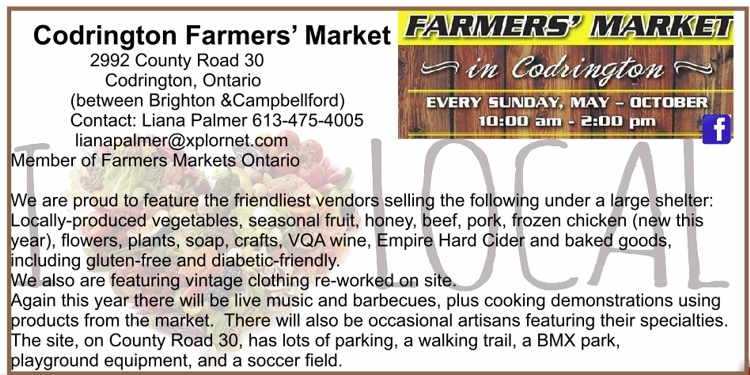 Have something to say about Codrington Farmers' Market?